You do not know when the flu will hit you. It can happen any day this year and worst, it may attack you this summer when all you want is to indulge in everything that is cold. Obviously, nobody wants it. But, do you know that your HVAC system has to do with preventing the flu? Discover how upgrading your heating and cooling system can help in truly amazing ways. The presence of mold, dirt, dust and air contaminants in your home can worsen flu symptoms. This fact makes it necessary to clean or change air filters especially during the peak seasons. Old and worn-out air filters might hold germs and bacteria that are filtered which increase your chances of getting ill. This is why you need to put money in quality air filters to prevent germs and bacteria from invading your home. Filthy, clogged and impaired air ducts? Name it! Your damaged duct system can be one of the main culprits of high electric bills and poor indoor air quality. Dirt buildup in air ducts breeds flu viruses so you should do a preventive measure to eliminate illness-causing contaminants in your duct system. All you have to do is keep it clean. Ask help from professionals for a duct cleaning service. Both high and low humidity at home triggers the growth of mold and viruses that can cause flu and other illnesses. So what should you do? Install a humidifier for the entire house. Make sure that it is carefully set up so it can effectively manage your indoor humidity. You just need to maintain a balanced and adequate humidity to keep yourself from the symptoms of the flu. Air contaminants are one of the leading causes of the flu. 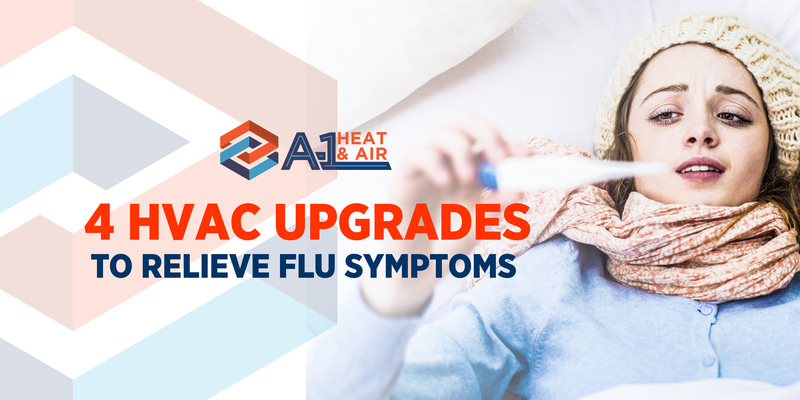 And with an inefficient HVAC system, you might not just get the flu but other serious complications as well. But by investing in industry-certified air cleaners and purifiers, you will not have any problem with sneezing, coughing, and allergies. A good air purification system can go a long way in giving you a cleaner indoor air, maximum comfort, and peace of mind. Would you mind doing some upgrades on your HVAC system? These tips are a sure way to lessen the chances of acquiring the flu and other illnesses. Talk to us at A-1 Heat & Air Conditioning for more helpful advice and tips.